World Tribology Conference (WTC) is open to those wanting to highlight progression in the field of Tribology. The conference is held every 4 years and the venue changes on each succession. The 6th WTC was held in Beijing from 17th September to 22nd September 2017. Jamal Umer and Gajarajan Sivayogan were accepted to present at their findings at this conference. WTC held over 1000 oral presentations and ad a wide range of applications where tribology is of high interest and important, ranging from bio technology, engine component and space. While many interested presentations ran in parallel, every day of the conference was highly useful for advancing research and seeing how others apply the same theory behind very different background. Jamal Umer presented his work on the friction optimization in internal combustion engines, specifically at the piston ring-liner interface. The lubricant-surface combination with various additive in the lubricant is critically analysed and explained with proper mathematical modelling is adopted to explain those results. Gajarajan Sivayogan presented his work on hypoid gears with particular interest on advancing current modelling techniques, with particular interest in how the lubricant behaves in such complex gearing systems. Automotive industry are highly keen on this as it can aid in reducing NVH issues, increase durability and ultimately increase efficiency. Both CDT students found the audience to be engaging and very helpful in providing support and advice on where the effort for the respective investigation should go towards. In fact the same can be said for the whole conference and Beijing. Both the locals and invited people were welcoming and kind, the atmosphere of the event was a highly delightful and a wonderful experience all together. It is important to mention that this conference gave a best platform for networking and collaboration with the some world leading tribology’s and scientist across the globe. 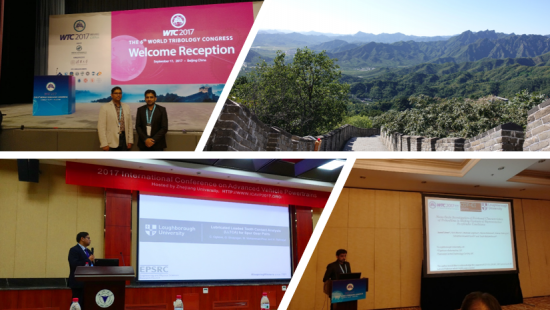 Following on WTC, Gajarajan Sivayogan was also invited to present at International Conference for Advance Vehicle Powertrains (ICAVP) where this was based in Hangzhou, China. Gajarajan Sivayogan presented his collaborated work with a Master’s student Callum Oglieve on Lubricated Loaded Tooth Contact Analysis (LLTCA). Where the main objective is to provide an alternative method to traditional Tooth Contact Analysis (TCA). The key differentiator between LLTCA and ordinary TCA is that TCA does contact consider rheology aspects, where the new proposed process does. Like WTC, the audience in ICAVP were highly interested in the topic and highly engaged with the topic with very useful advice on how to improve the work further. Loughborough University academic and CDT-EI supervisor, Dr Will Whittow, won the inaugural Men As Allies Award at The Women's Engineering Society (WES) Awards 2017. On receiving the award Will has said "I'm genuinely honoured to win this inaugural award. There are many amazing people who work tirelessly to promote STEM and Women in Engineering. We need to work together to change public perceptions. Engineering is millions of well paid jobs and covers incredibly diverse topics demonstrated by the PhD opportunities at Lboro! We need diversity of people to continue to innovate. My 1st PhD student won the Sir Robert Martin Prize for the Best Loughborough Student. If she can do it so can you." More details about WES can be found here. 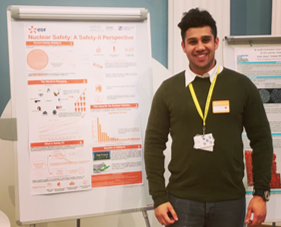 Cohort 3 researcher, Robin Hamer, reports on the 3 day event organised by his co-sponsor EDF Energy for postgraduates, EDF personnel and academics. The first day of the event consisted of interesting talks from Xavier Mamo (UK R&D Director) and Jean-Paul Chabard (Scientific Director R&D). These talks consisted of EDF’s scientific plan, their 2020 and 2030 vision which included plans for innovation. It was useful to align my PhD with the future plans of EDF as it was possible to see the contribution that I could make. Furthermore, I gained an understanding of how the business operates more thoroughly, aided by the ILM assignments. The poster session provided an opportunity to network and share work with fellow PhD students, the directors of EDF and other academics whom were interested by the concept of ‘safety-II’, especially Xavier Mamo. The second day consisted of more presentations from EDF employees, previous PhD students and technical presentations from current PhD students. The technical presentations provided a good insight into what other students at various universities around the UK were doing within the realm of the energy sector. Although my PhD seems to be very different from the purely Engineering and Chemistry based PhDs, it was still good to have some exposure to where my PhD fits in with EDF as a company, and the other students. Two presentations stuck out for me on this day: Paul Spence, EDF Energy Director of Strategy & Cooperate Affairs and Philip Ball, Leadership Development Partner. I enjoyed Paul’s talk about how EDF plans to grow, change and innovate to meet their 2020 and 2030 goals and I enjoyed the discussion regarding the imminent and future challenges, of which I posed my own questions. Philip’s talk about leadership and a technique to develop ones own leadership (Transactional Analysis) was very useful as we have not yet touched on it in our CDT training sessions. I felt the presentation made me more aware of how I act myself and thus how to best deal with others in a leadership role. The evening was a great time to relax and network in a less formal way as everyone headed to the pub and did an Olympic themed quiz. I found it much easier to talk to network especially with the higher up members of EDF as everyone seemed to drop their guard which made conversation and discussion much easier. Day three was the last day and since we all left at midday not much happened on this day. Everyone had the opportunity to have a tour of EDFs on sight Geo-solar centre which supplies Cannington Court with 100% renewable energy making it fully self-sustaining. It was interesting to see the technology behind this initiative and to see how easily building can become fully self-sustained. This event was in all a great success. It was extremely useful to listen to the presentations by employees higher up in the company whom exposed the students to the overall goals and vision of EDF. This helped us not only understand the different subsections of the business but helped us understand where our PhD fits into the bigger picture and thus gave us a sense of purpose and that our work was actually mattering. I found it very useful to network with other students and found that three other students at the retreat are from Loughborough also. I have definitely created some network opportunities and am looking forward to returning next year where I hope to give a technical presentation about my work. Cohort 3 research, Jorge Garcia, attended the first ever International School on Computational Microscopy (ISCM) in the paradisiac Mediterranean coast of Amalfi, Italy organized by the Institute of Applied Science and Intelligent Systems of the Italian National Research Council. It reunited researchers, postdoctoral and postgrad student’s universities and international research centres. The main topic of the international school was label-free unconventional imaging systems, which basically consists on optical systems for imaging of microscopic objects without the need of marking them with external labels or fluorescent toxic substances. The sessions also focused on the synergy of technologic research and start-up companies with workshops and lectures conducted by successful researchers. The lectures were carried by worldwide famous researches in the optics field from all over the world. Moreover, the new technologies and developments presented by the lecturers were outstanding. For example, Dr. Zalevsky from the Bar-Ilan University presented a project about a photonic “super ear” which was able to monitor heart beats and voice vibration from a long distance using a low-intensity non-invasive light source and a camera. Other highlight of the summer school was the workshop “Starting up your ideas” given by Dr. Park from the Korean company Tomocube. Dr. Park shared his experiences and advises in an interactive talk focusing on making the big step from research to entrepreneurship. Additionally, the event was the perfect opportunity to make networking with other postgraduate student working in the field of optics and digital signal processing. At the same time the event included a poster session where the participants were able to share their work to the others. Jorge presented his project about a compact holographic coherent sensor, which was well accepted by the optical community in attendance. In summary, the ISCM 2017 was a well-organized event where the new advances in the optical imaging field where presented. The relevance of this international school was to increase our knowledge on non-conventional optical measurements methods and being aware of what other similar research groups are doing in other universities around the world, meeting new people for possible collaborations in the future. To welcome our fourth cohort of researchers we held our induction week in the highlands of Scotland. Representatives from cohorts 1, 2 and 3 also attended to meet the incoming cohort and use the remote and idyllic location for a writing retreat. Prof. Marc Desmulliez, HWU ex-CDT-EI Director and supervisor of several CDT-EI students, gave an invited talk at the latest BioMIM Expo at Senlis in July 2017. It was the first time in his 25 years as an academic that Marc presented a technical talk in French, his mother tongue. The Conference, one of the few in the world devoted exclusively to biomimetics and nature-inspired engineering, was attended by over 1,000 people and combined scientific talk, exhibitions as well as presentations for the general public. The talk was devoted to the latest advances made by his research group towards the 3D printing of multi-materials using green chemistry. The £1M EPSRC research is funded under the “Manufacturing with Light” programme, and is in collaboration with Dr Robert Kay’s research group, formally from Loughborough University, now at Leeds University. The talk can be downloaded in YouTube at the following link https://youtu.be/yBEJuBLte0w alongside all presentations made in 2017 and 2016.